Being a triple-play service provider is no easy work. The bundled offering of multiple services (Internet, telephone, and television) calls for a sophisticated data center infrastructure that can handle the wide scale of operations. When ACT-India's renowned triple-play service provider-set up a similar infrastructure to manage its services, it faced the archetypal security challenge: Enterprise password management. The IT team at ACT had to handle more privileged passwords, which needed to be shared among members working in different shifts. Moreover, passwords of numerous servers and data center resources were shared over insecure platforms without access limitations. Eventually, the team was unable to monitor and maintain a record of data center or server-related activity. 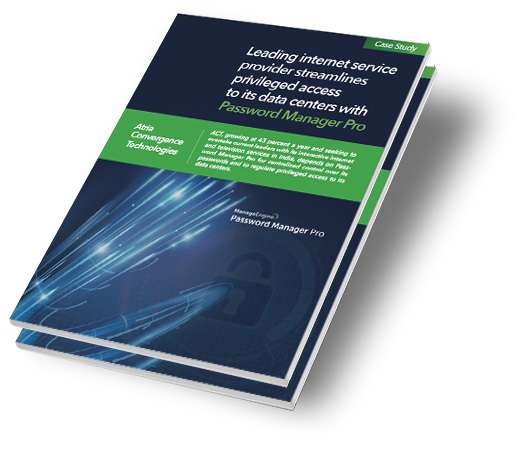 Today, ACT has streamlined privileged access to its data centers with an effective password management routine - achieved with the help of Password Manager Pro.